Do you run a pet taxi or Vet ambulance service, are you a mobile dog handler such as security or travel to shows with your dogs? We have put together a comprehensive package for you to enhance the equipment you carry on board. This package is as we supply it to HM Prison Service mobile canine units So, what’s included? 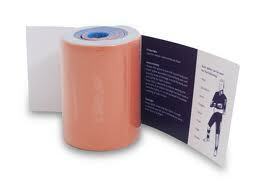 · 1m Roll of Splint for all splinting applications. All this for just £139.95 plus postage and packaging. * Spinal board not included. 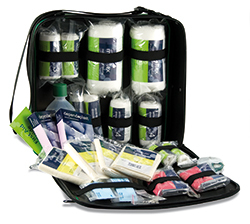 Kits may vary to the picture but the contents and bags will be the same or better as we try to secure the best deal for our customers The pet ambulance first responder kit is slightly expanded to the one we offer separately. This kit is available separately. Flexible Splint is a versatile, lightweight splint that can be moulded, bent, cut, curved and shaped to fit the contours of just about any body part - supplied as a roll of 91cm. May vary from that pictured as we use various suppliers to secure the best possible deal for our customers. 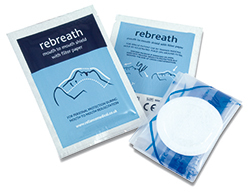 10 resuscitation face shields. These can be just as easily used on animals as humans as they utilize a membrane barrier.